A self-described minimalist, Amanda likes things clean, neat and functional. When her grandfather moved out, he basically took a bag of clothes and left everything else. The Hofmanns pared everything down, from the four sets of complete china they inherited to the wallpaper that was applied in each and every room. The house followed a traditional floor plan. There was a front entryway with a staircase. The formal living room with a fireplace was in the front right of the house and closed off with the exception of two small doorways. The kitchen was in the back of the house, adjacent to the living room. A den and sunroom were on the left side of the house. The Hofmann home floor plan | Red indicates walls they removed. Amanda and Martin did most of the renovation work themselves on a very small budget, the exception being that they did not lay the hardwood flooring or install the countertops. And the money saved on contractors allowed them to have more of the design elements they wanted. Amanda designed the space, and Martin brought it to life. When they moved in, they ripped up all the carpet, took down the wallpaper and painted almost every room in the house. Since all of the walls were covered in 50-year-old wallpaper that was applied with glue, it took a full week just to remove the wallpaper. They also removed chair rails throughout the house. They have the upstairs on their docket to complete next. For now, though, they are enjoying their “Home Sweet Home” in its new, updated design. Let’s take a look! 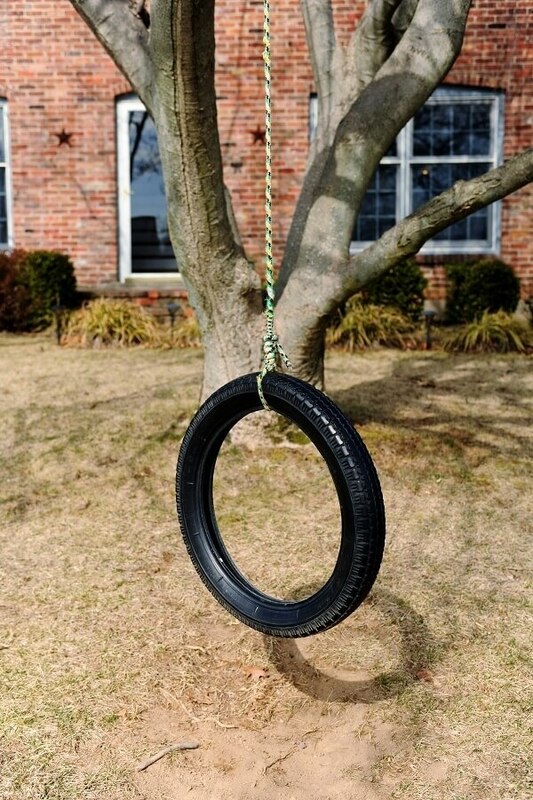 This vintage motorcycle tire swing on a very beloved tulip magnolia tree in the front yard greets guests. Amanda, her mother, her aunts and uncles and now her children have all climbed this tree, and their initials are carved throughout. The front door is a barn red that Amanda’s grandfather antiqued by hand. She added the dog door knocker from Anthropologie as a special touch. The living room and kitchen, together, was a bigger project in itself. After taking down a wall between the kitchen and living room and seeing how open it could become, they decided to take down another wall between the living room and the entryway. In typical fashion with any home remodel project, this then prompted replacing the flooring throughout the ground floor and moving fixtures. This is the living room with the wall removed that separated it from the kitchen. The original brass fireplace is on the left. The walls are a dark slate color with pops of white on the trim and pillows. Here, another wall was removed that opens up the new great room of the kitchen and living room to the foyer. A bright pink and red Ray LaMontagne poster stands out on this dark wall. Also in the kitchen is the floor-to-ceiling chalkboard, where Amanda does ongoing chalkboard art. Her latest chalk work is a birthday creation for her son on his first birthday. Stark elements of black and white are softened by this large wooden farm table in the center of the room. The table has seating for 10, in addition to a swanky fur highchair for their 1-year-old son. The kitchen cabinets were removed, but the footprint of the kitchen remained the same. They wanted black cabinets in a clean finish and streamlined hardware. Light Carrara marble countertops provide contrast to the dark cabinetry. Amanda cooks every night, and her cooking essentials are on the counter, including olive oil, salt and pepper, a mortar and pestle and fresh herbs. The lime green Kitchen-Aid mixer is a standout in this black-and-white kitchen. Cabinets on the upper portion of the kitchen wall were removed and replaced with open shelving. Subway tile was chosen for the backsplash. 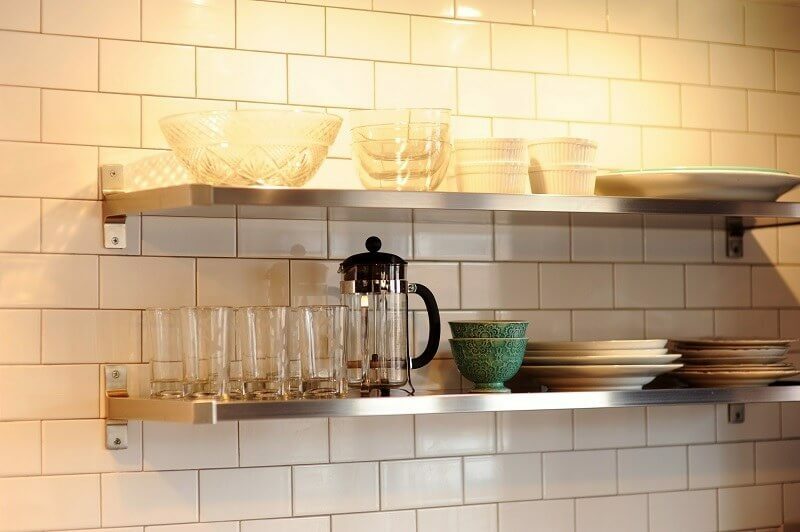 The open shelving is very minimalist; Amanda only has available the dishes she uses every day. The kitchen table is an antique “Take-Down” Table that had another life as a lab table at the University of Kentucky. Their son’s godparents bought it for them at the Burlington Antique Market in Ohio. Martin sanded and refinished it. The chairs are Tolix Marais chairs, found for a steal online. The den became Amanda’s studio and office, where she creates her jewelry, illustrations and calligraphy. In contrast to the dark paint in the living room and kitchen area, they opted for a light linen color in the den. The paint color coupled with the fantastic morning light make it an ideal studio for an artist. What’s more, the den contains a record player and a fantastic collection of old vinyl records. That goes well with the theme of good music in this home, which is filled with framed, colorful posters for Ray LaMontagne and Mumford & Sons. 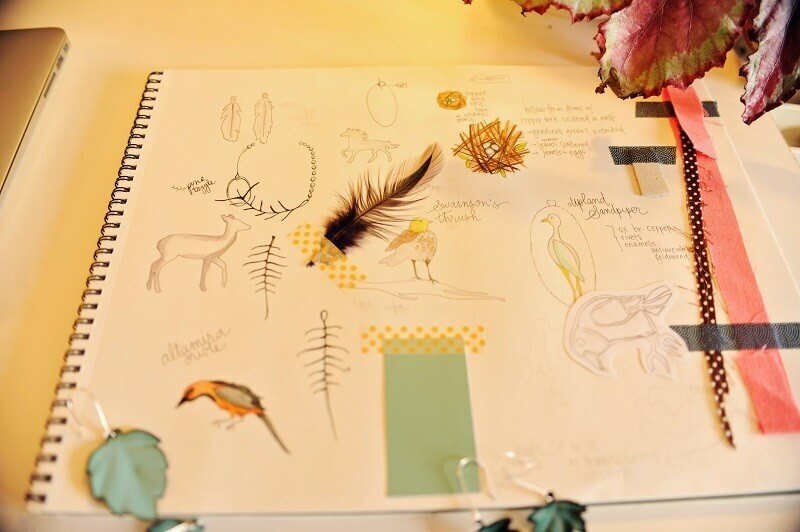 The den doubles as Amanda’s studio and office, where she creates her jewelry, illustrations and calligraphy. A large drafting table is on one side of the room, with art supplies and creations carefully organized throughout the space. This quilt was pieced by her grandmother and quilted by her great-grandmother, then given to Amanda for her high school graduation.She has more than 30 quilts and wall hangings from her grandmother that she rotates out. Shown here are thoughts and sketches for an upcoming illustration project. Some of Amanda’s jewelry is out on this table, as well. The den contains a record player and a fantastic collection of old vinyl records. There is a theme of good music in this home, with framed posters for Ray LaMontagne and Mumford & Sons throughout. On the right side of the wall are framed paintings of her grandfather’s, who is also an artist. The downstairs complete, the couple set their sights upstairs on their son’s nursery, which is a bright and airy room as well, with gray/blue walls and bright red accents. 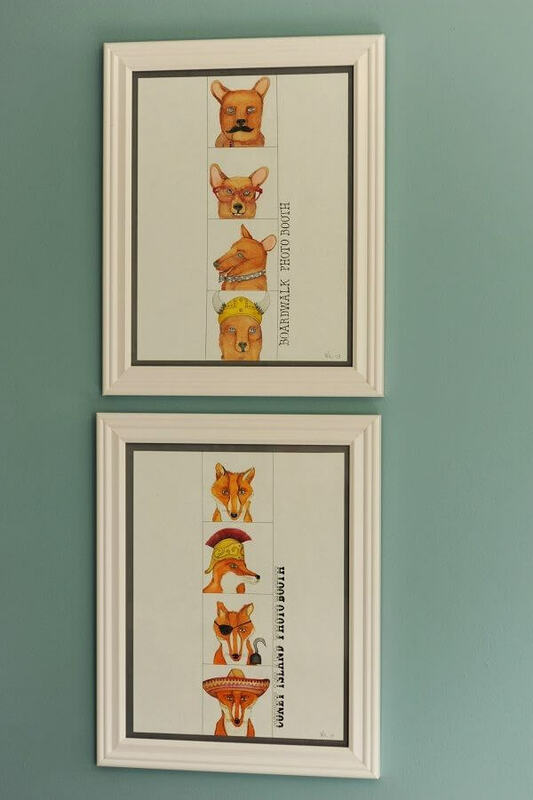 The nursery is a display of all of Amanda’s artistic talents, as so many of the pieces were made by her. Baby Marcus has his own room, with a nameplate his mother made out of wood. Fit for a boy, this blue and red room is bright and cheery. Baby Marcus has his own tent, a comfy red leather chair and a gray wooden toddler bed. Handmade mobile and illustrations by Amanda are in the nursery. 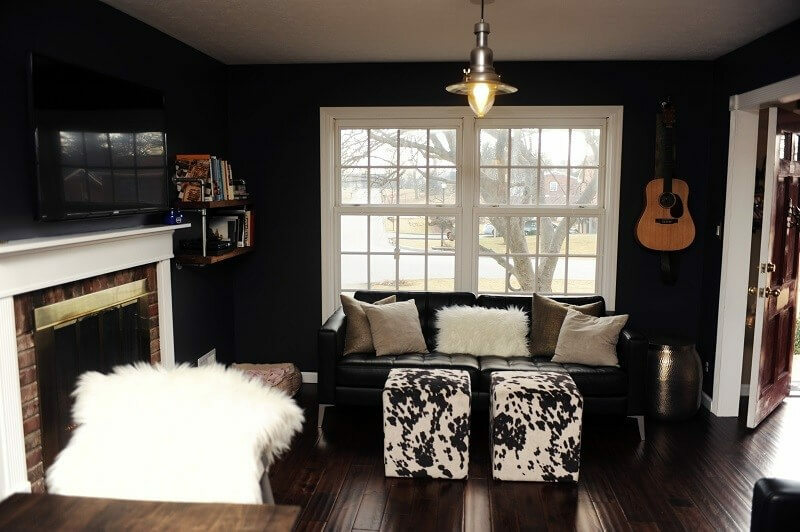 Modernizing this home took a big purge, some daring paint and powerful accents. Amanda loves that her grandparents raised their five children here and that she now gets to raise her combined family of five children here, as well. Seems like the perfect spot. Check out Amanda’s work and artistry here. As always, much gratitude to our photographer, Adele Reding, for her fantastic work. Visit her website at adeleredingphotography.com. Love homes, FINDS and more? Follow us on Instagram to see everything we love.